Just finished review of book "Oracle Data Guard 11gR2 Administration Beginner's Guide” by authors, my dear friends Emre Baransel and Nassyam Basha. 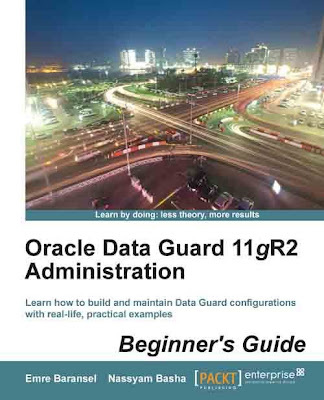 "Oracle Data Guard 11gR2 Administration Beginner's Guide” book is a good introduction to Oracle Data Guard 11g R2 with examples that will be useful to all DBA’s. It is also is a very good book in terms of helping beginner- readers from creating and configuring Oracle Data Guard (11g R2) configurations. By reading this book one will learn what standby databases, protection modes, transport and apply services including role transitions. The book also covered Active Data Guard and dedicated chapter for patching and Common Data Guard issues.